Relish the caustic creativity of this collection of zingers from great authors. Winston Churchill once said, "Tact is the ability to tell someone to go to hell in such a way that they look forward to the trip." On the other hand, you could throw tact to the wind and go straight for this collection of zingers from great authors. 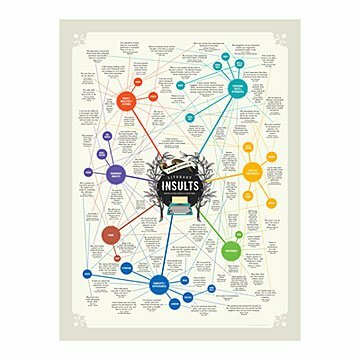 Tim and Aurelia Sanders' snark-filled chart compiles unforgettable insults in an interconnected map. They run the gamut, from sassy to sophisticated, including Hedda Hopper's playful hyperbole (You had to stand in line to hate him), Madame Roland's canine analogy (The more I see of men, the more I like dogs), and Jonathan Swift's understated wordplay (Some folks are wise, and some otherwise). And of course, a smattering of colorful insults from Shakespeare, the playwright who practically invented the art of the poetic put-down. It makes a great gift for any bibliophile or friend who enjoys acerbic wit. You might just note that the gift is made in good fun. Four-color, offset print on 100 lb., acid-free, FSC-certified paper. Made in Madison, Wisconsin. Gently unroll your chart and place into a frame, or weigh down chart's edges with books on a clean smooth surface. My son loves this poster! He uses it regularly to 'insult' his older brother! LOL!! This would look great in a classroom or home office and adds a bit of humor. I bought this for my wife to hang in her office and she loved it! She's a librarian who got her own office for the first time and needed something to decorate with. He coworkers love it too and think it's very clever. Great gift for the literary, intelligently amusing. I would have this laminated or framed . My son the theater major takes pride in his snarky comebacks, his references to the obscure, his timely rejoinders that encompass pop culture. This poster of literary insults will only help him become the legend he already is in his own mind: the ability to have some go-to insults based in literature will surely make him appear a little smarter than he really is, and what theater major doesn't want that! The product is great. Just don't forget to buy a frame because it is just the parchment paper and should be in some sort of frame for best viewing. It's a unique gift and can be given to different people for different reasons. I would buy again for a literary lover. It was a great gift for a literary friend, given as a secret Santa gift exchange In author group.